STOPTOBER: HIV & Smoking, why you should quit, and available help. Posted on September 25, 2013 by Tom | Comments Off on STOPTOBER: HIV & Smoking, why you should quit, and available help. In case you haven’t seen it yet, (or you have and you’re ignoring it) it’s “Stoptober” in 6 days’ time. Why is that important? According to Aidsmap, the online edition of Clinical Infectious Diseases reported that smoking has had a bigger impact on the prognosis of HIV-positive patients than HIV-related factors. In a survey of 2,921 HIV-positive adults, the authors calculated that a non-smoker aged 35 had a life expectancy of 78 years. This compared to a life expectancy of 69 for former smokers, and a life expectancy of just 63 for current smokers. The risk of non-HIV-related death was five-times higher for current smokers compared to HIV patients who had never smoked. HIV patients who were current smokers also had a four-fold increase in their risk of all-cause mortality. Previous studies have shown that HIV-positive individuals are more likely to smoke than their HIV-negative peers. According to the British Heart Foundation, over a third of gay men in the UK smoke, compared with the national average of 21%. The authors of the Danish research believe their findings have important implications for HIV care, showing the importance of smoking cessation counselling and support. Illnesses that are potentially related to smoking, such as cardiovascular disease and cancers, are being seen with increased frequency in those living with the virus. Quitting smoking has major and immediate health benefits for all tobacco users, including those living with HIV/AIDS. Quitting smoking decreases your risk of lung cancer and other cancers, heart disease, COPD, and stroke. Smokers with HIV also experience a decrease in HIV-related symptoms and an improved quality of life after quitting. Smoking weakens the immune system. It can make it harder to fight off HIV-related infections. This is especially true for infections related to the lungs. This is a risk for smoking cannabis as well as tobacco. Having HIV increases the risk of chronic lung disease and smoking can interfere with processing of medications by the liver. It can also worsen liver problems like hepatitis. People with HIV who smoke are more likely to suffer complications from HIV medication than those who don’t. For example, those who smoke are more likely to experience nausea and vomiting from taking HIV medications. 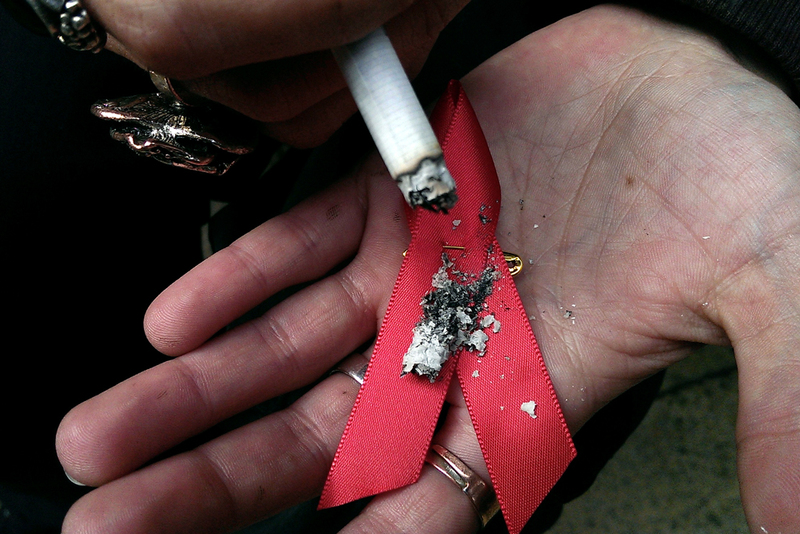 Smoking increases the risk of some long-term side effects of HIV disease and treatment. These include osteoporosis (weak bones that can lead to fractures, more information here) and osteonecrosis (bone death, more information here.) HIV treatment slightly increases the risk of heart attack, but smoking is the major controllable risk factor for heart attacks or strokes. Recent studies found that quitting smoking reduced heart attack risk in HIV patients more than other factors such as changes in medications. For women, smoking can increase the risk and severity of infection with human papilloma virus, this increases the risk of cervical disease. Recently, the bacteria that cause Mycobacterium Avium Complex were linked to smoking. They were found in tobacco, cigarette paper and filters even after they had been burned. Are you still reading? – Good, we hope this information hasn’t scared you off! – If you’re a smoker, you should know that help is at hand. If you’re not a smoker and know someone who is, whether they’re HIV positive or not, your support can go a long way to helping someone quit, and that’s where “Stoptober” comes in. Stoptober is a NHS initiative to encourage smokers to take up a stop smoking challenge for 28 days, in the month of October. People joining the campaign are able to receive support from a Stoptober pack, an online and smartphone app and a 28 day text support service. Research shows those who stop smoking for 28 days are 5 times more likely to stay smokefree. Stoptober will lend a hand to help smokers achieve this goal. To get your free Stoptober pack, visit https://stoptober.smokefree.nhs.uk/ and register. They also have a Facebook page and Twitter account you can follow along with smartphone apps which offer practical support, encouragement and personalised advice in the palm of your hand, throughout the 28 days, helping you every step of the way. You can also chat an adviser online or if you prefer the retro route, you can call them on 0800 022 4 332 between 9am – 8pm. There’s also a wealth of information and support available online too, just google “Stop Smoking” or visit some of these links, remember to come back and let us know how you’re doing in the comments below! Comments Off on STOPTOBER: HIV & Smoking, why you should quit, and available help. £1,000,000,000 From the UK to fight HIV, TB & Malaria! Posted on September 24, 2013 by Tom | Comments Off on £1,000,000,000 From the UK to fight HIV, TB & Malaria! The UK Government has just announced it is committing £1 billion to the 2013-2015 replenishment of the Global Fund to Fight AIDS, TB and Malaria and STOPAIDS is calling on its members and supporters to register their support for this decision. Incredible pledge of £1bn from @DFID_UK to @globalfundnews. UK wants us to #bethegeneration to control #AIDS – the world must follow! The pledge of £1bn over the next three years equates to a doubling of the UK contribution to the Global Fund, a collaboration between northern and southern governments, the private sector, NGOs and people affected by the three diseases, which has saved nearly 9 million lives in a decade. However the £1bn pledge will only be delivered in full if the Global Fund achieves its overall replenishment target of $15bn. The commitment from the UK throws down the gauntlet to other donor countries, like Germany, Australia and Japan to dramatically increase their contributions so the Global Fund can secure the $15bn it says could tip the balance in the three epidemics. The ambition of the UK commitment matches that shown by the Obama administration, which has pledged $1.65bn for 2014 alone. If the total generated is less than $15bn the UK says it will give 10% of the total number pledged. “This pledge puts us on the path to securing the investment we need to finally bringing AIDS under control. It will help save the lives of millions including women and girls, and with time will pay for itself through the release of billions of pounds in increased economic productivity and averted costs. A moment to cherish for all of you who have been working so hard to secure this commitment. Please make a noise! 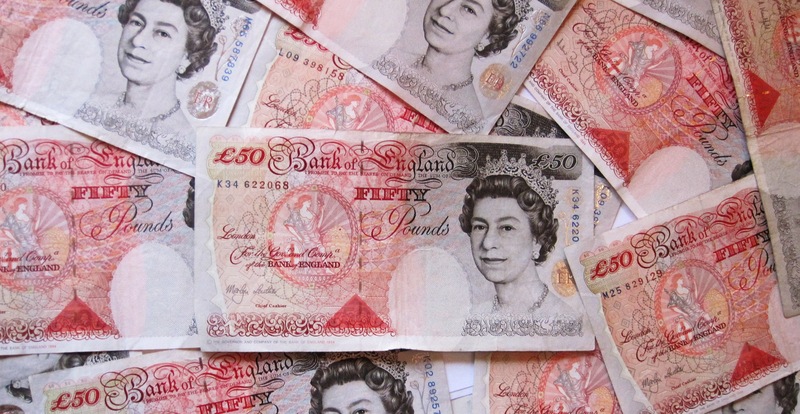 Comments Off on £1,000,000,000 From the UK to fight HIV, TB & Malaria! At the moment around 100,000 people in Britain are living with HIV, and it is estimated that as many as one in four of them don’t know they are infected. It’s hoped that making HIV tests much more accessible will encourage many people to take control over their own health. HIV Testing has been available for just under 30 years, presently it’s available from GU clinics and registered testing centres such as LASS and from April next year, home testing for HIV will become legal in the UK. To slow down the spread of HIV and help people to access treatment, LASS invests in rapid testing services in community settings. There is particularly low uptake in some African communities, so LASS trains volunteers from these communities to carry out testing and to provide information. We provide testing at a range of events and venues including African football tournaments to reach people who otherwise wouldn’t be tested. We also provide services for people with HIV who maybe coping with other issues like poor mental health. We also provide healthy living training. If you would like to join the team and become a community HIV tester with LASS, we are running training sessions this Thursday and Friday (26th & 27th September) – from 9.30 to 4.30 on both days at The Michael Wood Centre. This course is available to LASS volunteers only. The course covers theory and practice about HIV transmission, Basic HIV knowledge, treatment and benefits of testing, Pre-test “discussion” and information, Sharing test results, Inclusive practices and consideration of different communities and cultures, Role play scenarios, Procedures to use testing kits and Working with different clients. Following the training, you will need to complete a written test. To enrol on the course, please contact us on 0116 2559995 or email Celia or Eric for more information. In a breakthrough six years in the making, an international team of researchers has determined the precise atomic structure of a cell-surface receptor that’s used by most strains of HIV to infect human immune cells. The finding could result in medicines that block the process. HIV researchers have been making great strides recently — and thank goodness for that. Since making its unwelcome debut in the early 1980s, HIV/AIDS has killed more than 28 million people worldwide, with more than 34 million people currently living with the virus infection. Back in March, scientists functionally cured a baby infected with HIV. A week later, doctors announced that a similar technique had effectively cured 14 adults. And late last year Canadian researchers announced that their efforts to create the world’s first HIV vaccine had cleared a major hurdle after a successful Phase I trial. Relatedly, it was only yesterday that researchers from Oregon Health & Science University announced that they have developedan HIV/AIDS vaccine that can completely clear an AIDS-causing virus from the body. There’s even a drug, called Truvada, that’s proven to reduce the risk of HIV infection. The war on HIV is clearly in full swing — and a new international study has made yet another major stride, this time by mapping out the molecular structure responsible for HIV infections. The target is a receptor called CCR5 — and it’s one of two main entry points that HIV uses to launch its attack on the human immune system; CCR5 is a protein on the surface of white blood cells that’s involved in the immune system, acting as a receptor for chemokines (signalling proteins secreted by cells). 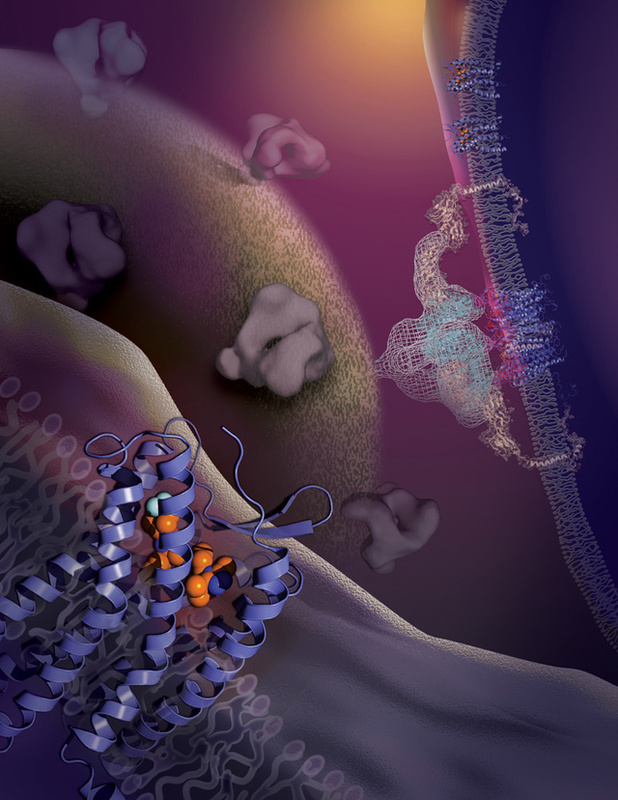 After binding to it, an HIV protein fuses to the cell membrane beneath as it digs its way inside the cell. Infection ensues. The other receptor that performs this feat is CXCR4. Together, the two belong to a family of receptor proteins called G-protein-coupled receptors (GPCRs) which regulate a host of functions in the human body. 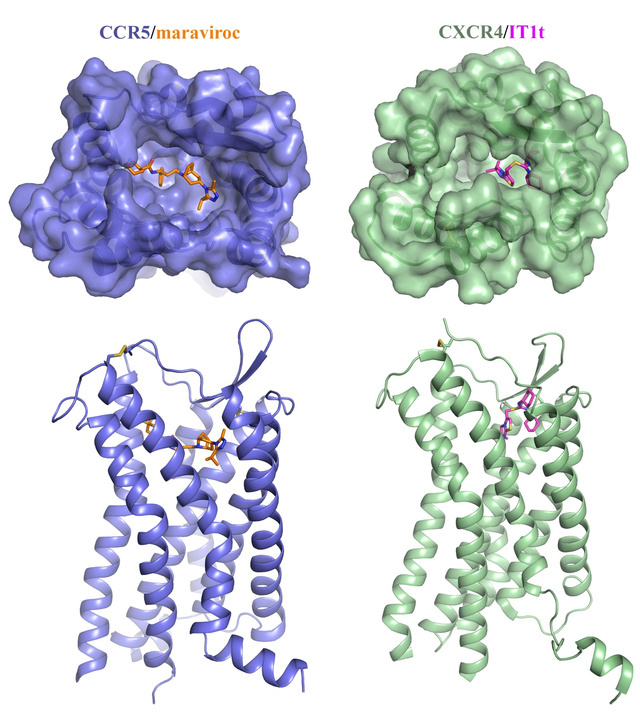 These receptors are crucial to scientists when designing drugs. Until now, however, scientists haven’t been able to properly visualize the precise molecular structure of these labyrinthine receptors. Previous studies have successfully solved CXCR4’s structure, but the exact way it recognizes and binds to HIV viral proteins has remained a mystery. Indeed, without a hi-res molecular “picture” of the receptors, designing drugs is difficult — if not impossible. 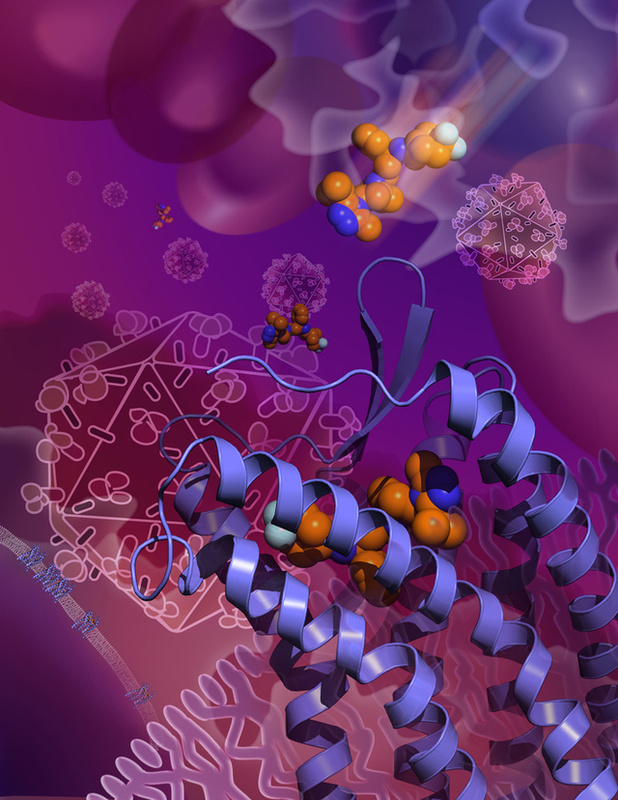 To capture the high resolution, three-dimensional atomic structure of the receptors, a team supported by both US and Chinese research agencies (including The Scripps Research Institute in California) considered Maraviroc, an antiretroviral drug and entry inhibitor used to treat HIV-1. It’s a receptor antagonist that binds the co-receptor, making it unavailable to circulating HIV. In the new study, the researchers demonstrated the precise spot where Maraviroc attaches to cells and blocks HIV’s entry. 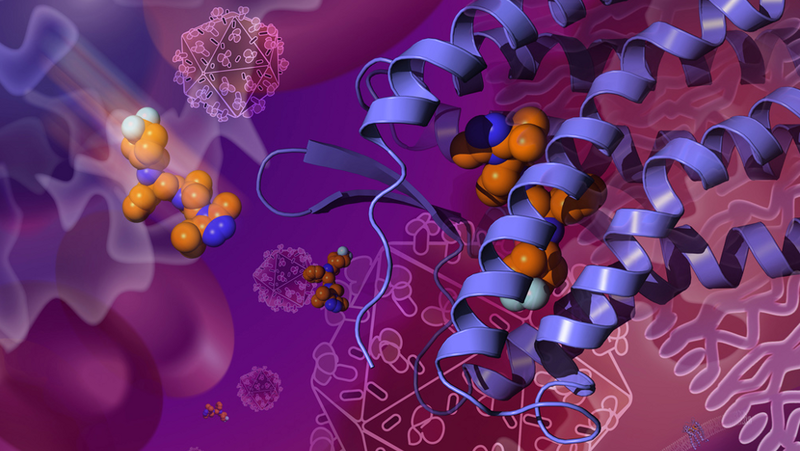 Maraviroc was used by the researchers to bind an engineered CCR5 receptor. It was then purified and crystallized, resulting in a receptor/drug complex that measured 2.7 Angstroms. By looking at this bound complex at such a high resolution — where the receptor was made inactive and unresponsive to HIV — the scientists were able to catch a glimpse of the molecular pathway by which HIV fuses with cells, including the molecular-scale quirks that allow some strains of HIV to escape CCR5 inhibitors. The study, which appears in Science, will help scientists to both improve existing HIV drugs based on CCR5 inhibition and to design new drugs altogether. “We hope that the structure we determined can be used to understand the molecular details of the current viral strains of HIV entry, to develop new molecules that can inhibit both CXCR4 and CCR5 receptors, and to block future strains that might emerge and be addressed with second generation HIV entry inhibitors,” noted Beili Wu, a researcher from the Chinese Academy of Sciences’ Shanghai Institute. via i09 Read the entire study at Science Express . Many older people with HIV say they are stigmatised because of their age, leaving them feeling isolated and afraid, a study suggests. Researchers at Keele University say HIV is still widely seen as a disease of young people. They say older women, in particular, fear they will be seen as “undignified” or “sexually irresponsible”. Many in the study also expressed fears over the uncertain impact of the disease as they moved into old age. Thirty years on from the discovery of the Aids virus, the public health warnings that followed, including the “tombstone” adverts, still have a powerful resonance for those who saw them. They helped to shape perceptions of a disease seen then as a death sentence. Now advances in treatment mean people with HIV can have near-normal life-expectancy. And that has had a huge impact on the types of patient needing treatment. Dr David Asboe, a consultant in HIV medicine at Chelsea and Westminster hospital, recalls the desperate outlook for patients he looked after 20 years ago – usually young gay men. “We knew that once patients had an Aids diagnosis that would be uniformly fatal. The average life expectancy was approximately two years,” he says. Today, half the people Dr Asboe sees are aged over 50. Some are in their mid-80s. They include gay men and heterosexual men and women. Some were infected in the UK, some overseas. A significant proportion, he says, acquired HIV recently. He says there seems to be a myth that as people get older they might somehow be protected. That, he emphasises, is not true. Dr Asboe, who is also chairman of the British HIV association, has been involved with the HIV and Later Life (Hall) study based at Keele University, which has looked at the social and psychological impact of the virus for people over 50. This is a growing cohort. According to the Health Protection Agency, in 2011 more than one in five adults accessing HIV care in the UK were over 50. In 2002 it was one in nine. The researchers used focus groups, surveys and life-history interviews with 76 older people in the London area living with the virus. Dr Dana Rosenfeld, who led the project, says there was an “immense knowledge gap” in this field. She says it has revealed a sense of anxiety about how they may be perceived. “A lot of the people to whom we spoke, particularly but not exclusively the women, spoke of their sense that they would be seen as undignified, that having HIV in later life would be read as sexually irresponsible. That was a worry for 63-year-old Adrienne Steed from Blackburn, who was diagnosed with HIV 11 years ago, infected by a long-term partner. He had died two years previously of liver cancer. She did not know he had had HIV so when she started having symptoms it did not occur to her – or to the doctors she saw – that she could be carrying the infection. “It was a terrible shock to me and something I remember to this day. I had no idea I was HIV-positive. It was the last thing on my mind,” she says. It took four years until she felt able to tell her son. “During that time I experienced what it’s like to live as an invisible woman with this big secret that you couldn’t tell anybody. “It was a horrible time. It’s the stigma. You feel ashamed of yourself even though you’ve got nothing to be ashamed of. Now she helps others through a blog and local support group, so – as she puts it – they don’t have to live with what can feel like a “dirty secret”. “Once they’ve spoken to me it normalises it a bit more,” she says. The Hall study found the experience of ageing with HIV was heavily influenced by community. Older gay men were more likely to know other people with the virus, and to know more about support organisations. Black African heterosexual men and women had also lived with the spectre of HIV for years, but were less likely than gay men to disclose their status to others, the study said. Many white heterosexuals, meanwhile, felt they were a “minority within a minority”, and that their family and friends would be shocked by their HIV status. Most of those who took part in the survey felt lucky to have survived into later life, but many were troubled by uncertainty over the physical impact of the virus or side-effects of treatment for this – the first generation to age with HIV. Our AGM is a public meeting where our Trustees report back on the management & finances of the organisation for the previous year. Trustees are elected & re-elected for the forthcoming year and members have the opportunity to put questions to the board & vote for decisions and for Trustees. It’s also a great opportunity to meet their staff and volunteer workforce. Our meeting last year became fully booked quite early, so we request you use the orange link below to register your attendance so we can have an indication of the numbers expected.